In the late 1880s Emily Dickinson is writing prolifically, baking gingerbread, and enjoying a passionate, lifelong affair with her friend and sister-in-law Susan...yes this is the iconic American poet, popularly thought to have been a reclusive spinster. Molly Shannon leads in this reappraisal of Dickinson, informed by her private letters. While seeking publication of some of the 1,775 poems written during her lifetime, Emily (Shannon) finds herself facing a troupe of male literary gatekeepers too confused by her genius to take her work seriously. Instead her work attracts the attention of an ambitious woman editor, who also sees Emily as a convenient cover for her own role in buttoned-up Amherst's most bizarre love triangle. "The film has the rich look of a period-authentic drama (...) There’s little running time to lavish on Dickinson’s actual poetry"
"The best lesbian comedy in years (...) [It] is anchored by a surprisingly touching love story between Emily and her friend from childhood"
"The humble production and peculiar tone of 'Wild Nights' will likely (...) limit its appeal (...) The film's vision of her long relationship with Susan is warmly funny." "The life and work of Emily Dickinson are subject to a delightfully droll — even gay — reinterpretation (...) This is an irreverent film, but its lightness is meaningful." "Despite the juicy details and fascinating topic, it’s disappointing that the stilted tone makes it so difficult to connect emotionally with this important story." 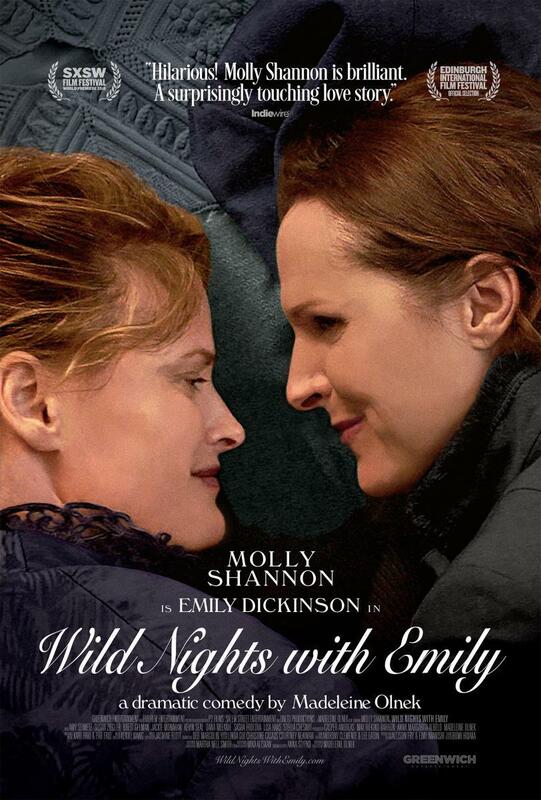 "[Olnek’s script] becomes the rock of this film (...) There are so many reasons to adore 'Wild Nights With Emily,' but the top may be Olnek’s refusal to adhere to the accepted history."